And Pete gets let out to play once more, this time with the Bulgarian Symphony Orchestra (called SIF 309 and I don’t know why) at the studios of Bulgarian National Radio. Excellent studio (built by the Nazis apparently), excellent orchestra, excellent production team – result, all round (though next time, the hotel is not going to be in the red light district, but it didn’t say anything about that on the internet). The score was for Sea Wolf by Richard Mitchell, with a brass session (10 players) and 3 string sessions (40) players. We crammed over 45 minutes of music in and it could not have been performed and recorded more efficiently – total professionalism from all involved. The composer (Richard Mitchell) likes to put his scores together with both traditional and production techniques. 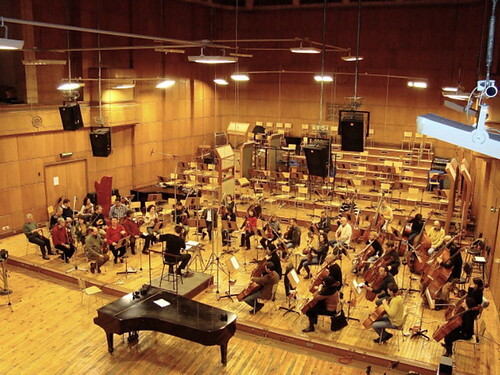 The ‘traditional’ is where the orchestra plays the cue pretty much as it will appear in the soundtrack. The ‘production’ involves recording individual components that will be moved around and layered up against a variety of other audio parts to create a soundtrack. I guess you could say that we’re recording a collection of ‘samples’ appropriate to the sound design of the score – a very flexible and creative way of working, though it makes the session less obviously satisfying, as many takes involve (for example) just the violins, or just cellos/basses. There is a perception that an orchestral session puts the whole score together in one performance, but in reality many composers like the flexibility of combining both ‘traditional and ‘production’ approaches. And if you think London is where you get the best spec studios, this one ran ProTools, through an SSL desk, Genelec monitors and Neumann mics. And coffee was about 25p a cup. But I guess what makes a gig like this really work is not the gear but the people. There were times I felt my Bulgarian colleagues even tried too hard! 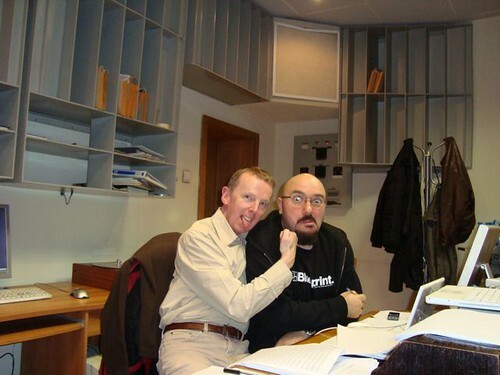 From the guys on the front desk at the hotel to Protools meister Vlad Boyadjiev and conductor Deyan Pavlov – I’m not sure I needed to be there, but don’t tell the composer! Didn’t bother changing my Levs back to pounds, I reckon I’ll be going back soon enough.